Art originated with the enhancement of naturally occuring phenomena to emphasize and communicate suggestive elements. 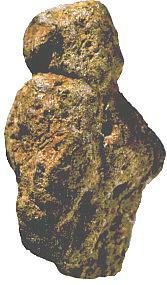 What is apparently the oldest figurine in characteristic female form, is a small (3 cm.) modified piece of lava stone, called tuff . It has been found together with more than 6,800 pieces of worked flints. 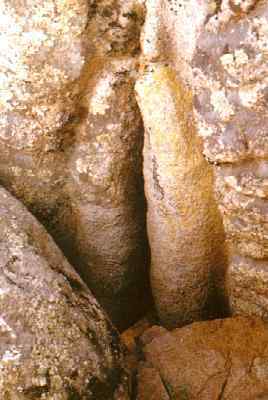 in the Levantine area of southern Syria between two layers of volcanics, the upper one is about 230,000 years old, and the lower one approximates 800,000 years old. This places the figurine in the Acheulian Paleolithic. Thus it predates Homo Sapiens Sapiens and Homo Sapiens Neanderthaliensis, and has been made by very Archaic Homo Sapiens or Homo Erectus !! Alexander Marshack, who has studied this object using high magnification microscopy, has concluded that toolmarks are present indication modification and enhancements of the natural features of the pebble. Homo Erectus or Archaic Homo Sapiens !! It is a pleasure and inspiration to read this book and view its many illustrations. Photo: © Alexander Marshack. Bahn, P. and Vertut, J. (1997). This photo taken from a different angle has been released by the Jerusalem Museum where this 3 cm object is on display. Better known than these photo's of the genuine object is the one of a slick and misleading commercial replica. This photo can be seen on : "Comparison of the Slick Commercial Replica with the Genuine Object"
UPDATE This figurine has also been studied in great detail by Dr. Francesco d'Errico (Institut de Prehistoire et de Geologie du Quaternaire, Talence, France) and April Nowell (University of Pensylvania). An article was published in the Sept.25, 2000 issue of the National Geographic News. 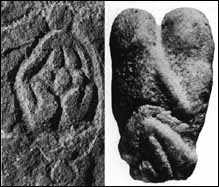 The left image is a petroglyph from the Laussel cave in France, and dates from the inter Gravettian/Solutrian, about 18,000 to 20,000 B.P. The Coital figurine on the right came as far as I know from the Negev Desert, and is of similar age. Note the antiquity of the Yab Yum position ! The Kumeyaay Native Americans enhanced natural features in granite rock to create fertility shrines. The one depicted here is one of several in the Anza-Borrego Desert State Park in Southern California. See also other Yoni rock images on the on Don Gennero's website "Pertroglyphs at Indian Hill, Canabrake etc." Another example of a Fertility Shrine from Southern California. This is a natural rock enhanced with paint. I do not know the tribal affiliation.